The Statue of Zeus at Olympia was erected nearly 2,500 years ago in Olympia, Greece. 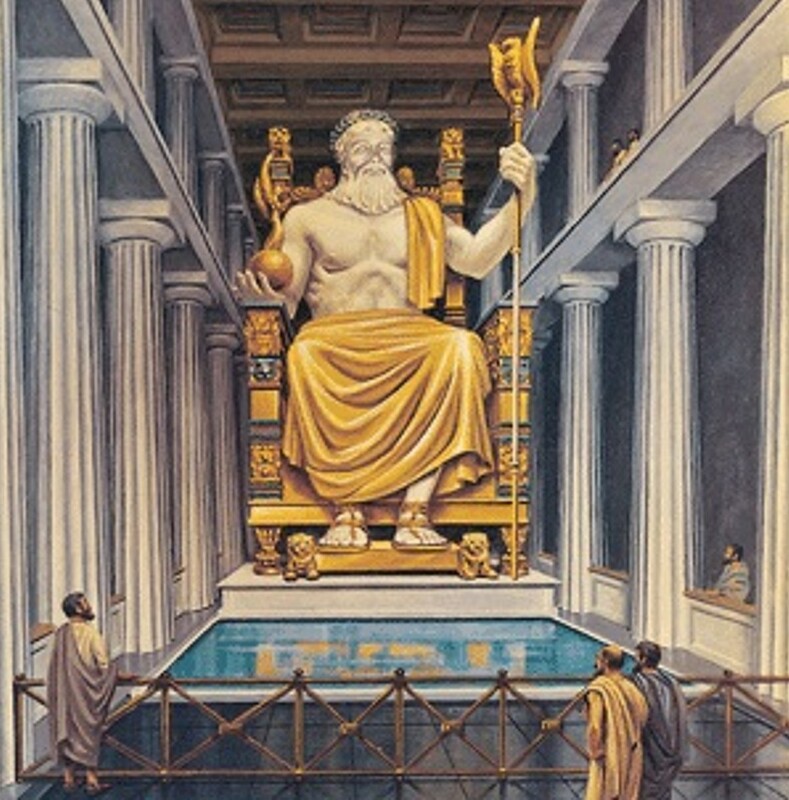 The colossal statue was created by Greek sculptor Phidias and stood 43 feet tall, which was an amazing achievement at the time. By the standards of the day, the Statue of Zeus would have been a breathtaking sight as it towered over the ancient city of Olympia inspiring fear and devotion to the god of the Greeks. Besides inspiring the Greek people to love and fear their god’s, the Statue Of Zeus also served another, very important purpose. For the Greek people and visitors alike, the statue demonstrated the power and wealth of the Greek empire. The ability to erect such an impressive statue would have made the Greek people proud of their country and made visitors envious. A dual strategy of military power and impressive civilization was employed by the Greeks and later the Romans to build impressive empires. An ancient text, written by Greek geographer Pausanias, gave an account of the site where the statue was constructed. Archaeologists used this information to pin point the exact location where they found terracotta molds of the statue and personal items which carried the sculptor’s name. The exact time and reason for the loss of the Statue of Zeus is not clear. There is evidence to suggest that Roman Emperor Caligula ordered the statue to be dismantled and moved to Rome. There have been written accounts that this was not carried out before Caligula’s assassination. Roman historian Suetonius wrote that the scaffold fell and the workers ran from the site in fear of Zeus. Other ancient historians recorded differing accounts of the loss of the statue. In the 11th century George Kedrenos, a Byzantine historian, wrote that the statue was moved to Constantinople where it was destroyed by fire in 475 AD in the Palace of Lausus. This palace was known to house a vast collection of ancient and mythical statues from around the world before it was destroyed. This does seem to be a credible last resting place for The Statue Of Zeus, however, some historians argue that it was destroyed in Olympia in around 425 AD and some evidence does seem to suggest this. It is possible that this was the time the statue was moved to Constantinople which would explain the theories that it had been destroyed at that time. Wherever its final resting place was, the Statue of Zeus stood proud over Olympia for some time and was truly a wonder of the ancient world.